Followers of this blog will know of my plans to go and explore Ethiopia at the end of this year. Being the exciteable sort I am and having ready access to internet and the Lonely Planet guide to the country, I have started doing research into the people, landscapes and history of the country. It was, however, an unrelated book that I have been reading which mentioned the Danakil Depression. Oh my god. 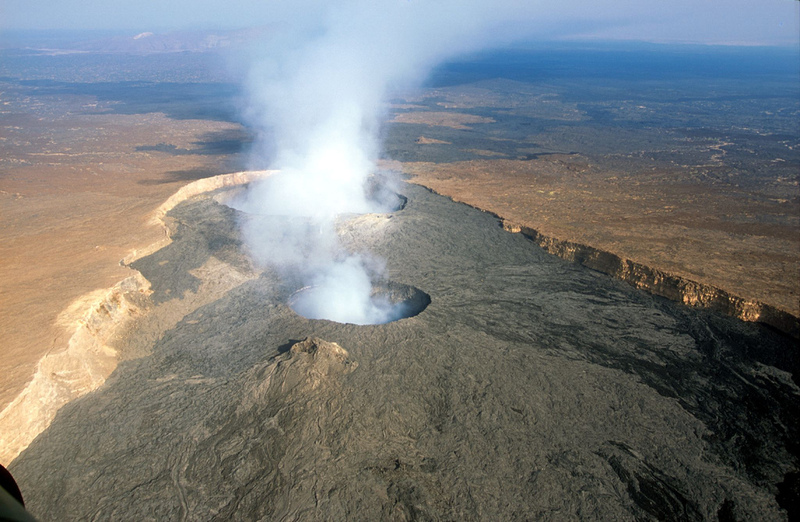 A special place called “Erta Ale” is found in the Afar depression at 13.6°N, 40.67°E, 613m . It is a shield volcano, which has a base diameter of 30km and is only 500m high. In its vast summit caldera (1600x700m) there are two pit craters. The larger one (300-400m diameter) in the northern part contained a lava lake in 1968 and 1973 but is now inactive. A central, but smaller pit (140m diameter, 60 to 90m deep) now has an active lava lake 60m wide and 100m long . Now I don’t want to commit to having to see this place before I have properly consulted with my likely travelling companion, but damn if I am not going to try to get there.